One of the more recurring rumors about where Arrow is headed is that at some point, John Diggle will become the TV version of popular Green Lantern John Stewart. This was fueled further when David Ramsey, the actor who plays Diggle, said that it has been discussed by the producers, although that was far from confirmation that it would actually happen. Now, one of the Arrow showrunners has finally addressed whether ‘space cop’ is a career in Diggle’s future. Short answer: don’t expect the the former Army man to be making emerald constructs in the near future. It’s funny, I’ve spoken to David quite a bit about this issue, I know it keeps coming up. I spoke to [writer] Geoff Johns at DC after that interview went viral. Basically, John Diggle is now a character in the comics… John Diggle is John Diggle. We’re not being coy and saying John Diggle is someone else, i.e. John Stewart. DC has other plans for that character. We love David, and we love the character of John Diggle that he’s created. We have really cool plans for him… they involve a wedding ring, but they don’t involve a power ring. Diggle has been part of Arrow since the beginning, and he received such a positive reception that he was introduced in the Green Arrow comic book in 2013. He’s already proved his worth without having to become a superhero or change his name. Besides, his schedule is already hectic enough without adding an alien ring to the mix. Upcoming stories for Diggle on Arrow include marrying Lyla (whom he proposed to in “The Brave and the Bold”), teaming up with the Suicide Squad again, and a conflict with H.I.V.E., the organization that had his brother assassinated. However, as Guggenheim has said, “anything can happen.” So perhaps events in Arrow (or even The Flash) may one day lead to lead to him becoming the protector of Sector 2814 in some capacity. It’s also interesting that Guggenheim said DC has other plans for John Stewart. Last year, Warner Bros. scheduled a Green Lantern film for 2020, and it’s likely the character will also be a member of the Justice League. 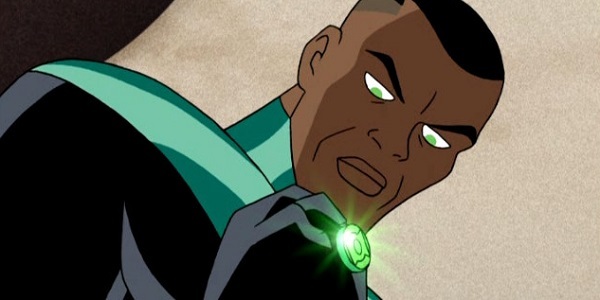 Rather than give us a rebooted Hal Jordan, perhaps the DCCU is following in the footsteps of the Justice League animated series and making John Stewart the DCCU’s main Green Lantern. That would explain why Tyrese Gibson has been campaigning for the role recently. If that’s the case, the chances of seeing John Stewart on TV, whether it’s Diggle or someone else, will diminish significantly, since DC likes to keep their characters either on the movies or the TV shows, rarely both. Barry Allen being one of the exceptions. You can catch John Diggle assisting Oliver Queen on Arrow Wednesdays at 8/7c on The CW.